I’ll still dangle the hope that I’ll get a chance to fix the error structure at some point, but for now my curiosity is satisfied on most counts. Much of the conversation concerning replication often appears to be based on the idea that a large fraction of scientific errors, or incorrect conclusions or problematic results are the result of errors in coding or analysis. The idealised implication being, that if we could just eliminate coding errors, then science would be much more error free. While there are undoubtedly individual cases where this has been the case (…), the vast majority of papers that turn out to be wrong, or non-robust are because of incorrect basic assumptions, overestimates of the power of a test, some wishful thinking, or a failure to take account of other important processes …. In the cases here, the issues that I thought worth exploring from a scientific point of view were not whether the arithmetic was correct, but whether the conclusions drawn from the analyses were. To test that I varied the data sources, the time periods used, the importance of spatial auto-correlation on the effective numbers of degree of freedom, and most importantly, I looked at how these methodologies stacked up in numerical laboratories (GCM model runs) where I knew the answer already. That was the bulk of the work and where all the science lies – the replication of the previous analyses was merely a means to an end. You can read the paper to see how that all worked out (actually even the abstract might be enough). However, the bigger point is that reproducibility of an analysis does not imply correctness of the conclusions. This is something that many scientists clearly appreciate, and probably lies at the bottom of the community’s slow uptake of online archiving standards since they mostly aren’t necessary for demonstrating scientific robustness (as in these cases for instance). In some sense, it is a good solution to a unimportant problem. For non-scientists, this point of view is not necessarily shared, and there is often an explicit link made between any flaw in a code or description however minor and the dismissal of a result. However, it is not until the “does it matter?” question has been fully answered that any conclusion is warranted. The unsatisfying part of many online replication attempts is that this question is rarely explored. To conclude? Ease of replicability does not correlate to the quality of the scientific result. Having someone’s code is obviously useful if you want to know exactly what they did. If I had G’s code and results, I could probably figure out why they get different sensitivity in their Moberg experiment, for example. That could be rather important. On the other hand, the R and G articles fail to specify a number of details that I find unimportant, because I’m more interested in robustness of the results with slightly different methods and data. G’s article doesn’t fully specify the simulation approach or selection of Monte Carlo parameters, and R’s article doesn’t specify the details of its smoothing method (unless perhaps you chase citations), for example. Neither, as far as I know, archives specific data, though it’s easy to find comparable data. 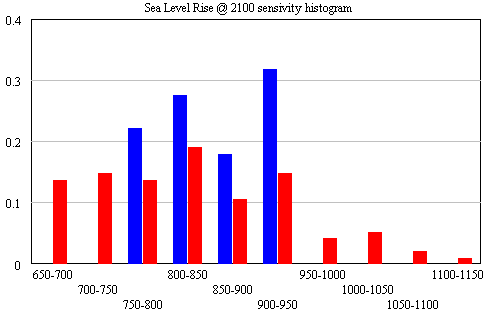 The sea level model is unusual in that it is conceptually very simple. Most other models would be much harder than this one to replicate without source code or some kind of detailed spec; the methods section of a paper is seldom adequate. I don’t think coding errors are rare. I think they frequent, and that complex models are frequently infested with dimensional inconsistencies and other problems that would benefit from exposure to daylight. Coding errors of grave consequence may be comparatively rare, but that’s of little comfort when the stakes are too high to wait for the normal process of science to separate the wheat from the chaff. Having someone’s code is a hindrance in some ways. Replicating a model without code requires one to revisit many of the same choices the original modeler had to make, which is critical both for developing understanding and for identifying possible suspect assumptions. On the other hand, with code in hand, it’s possible to very quickly perform checks for robustness in extreme conditions and the like, which may reveal problem behavior. 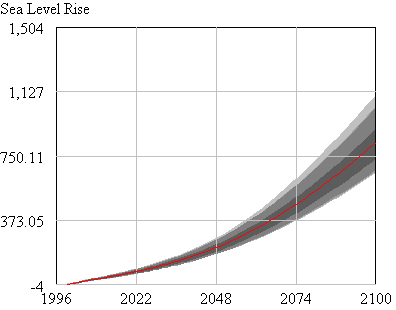 I seriously doubt that ease of replicability is uncorrelated with quality. Replicability might not be necessary or sufficient for quality, but as a general habit it sure helps. Replicability is not free. It took me at least twice as long to document my exploration of R and G as if I’d just done it and told you the answer, but now you can pick up where I left off. Next Next post: OMG Did I say that out loud?